Boogeymen are known to haunt the night and hide in closets and underneath beds. 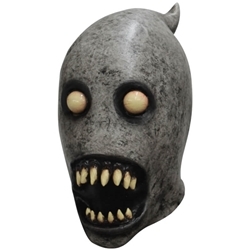 This Halloween dress-up and scare with this boogeyman mask. This mask can be paired up with almost any horror costume to create a personal take on the Boogeyman. The Boogeyman mask is colored as pictured. This is a full size latex mask that fits over your head. Perfect for Halloween and haunted houses. Mask is one size fits all. For a more comfortable fit it is recommended that you wear a nylon hood underneath the mask.